For the English hard rock band, see Rainbow (band). 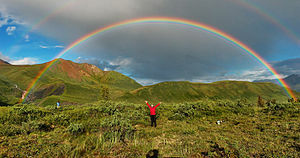 A rainbow is an arc of colour in the sky that can be seen when the sun shines through falling rain. The pattern of colours start with red on the outside and changes through orange, yellow, green, blue, to violet on the inside. Sometimes a second, larger, dimmer rainbow is seen. A rainbow is created when white light is bent (refracted) while entering a droplet of water, split into separate colours, and reflected back. A rainbow is actually round like a circle. On the ground, the bottom part is hidden, but in the sky, like from a flying airplane, it can be seen as a circle around the point opposite the Sun. Rainbows often appear after storms, and are popular symbols for peace and harmony in many cultures. The sun is giving light at the back of the observer at a low distance up or angle. Rainbows always appear opposite the Sun: they form circles around the shadow of your head (which is the point opposite the Sun). Sunlight is white, and is a mixture of many different colours. Water and other materials bend the different colours at different angles, some more strongly than others. This is called dispersion. By splitting up white light into separate colour, rainbows appear colourful even though the light hitting them is white. The observer is at a place with clear sky above. as upright bands of spectrum in far away rain even if it does not fall on the earth. An unnatural rainbow effect can also be made by spraying drops of water into the air on a sunny day. This page was last changed on 23 April 2019, at 20:29.